Mint tins are different from any other candy receptacle. They flip open and shut easily. They’re accessible. They fit in back pockets perfectly, and I usually don’t have to worry about my Altoids spilling in my purse because they close tightly. You can make things from mint tins, like a case for your iPod Nano and many other things. But mint tins aren’t just useful, functional and customizable. As the members of the Mint and Gum Tin Collecting group have already discovered, mint tins are collectible. Collectors in the 25-member Yahoo! group give each other the heads up on new tins, post pictures of their collections and pose questions about specific tins and the art of collecting them. 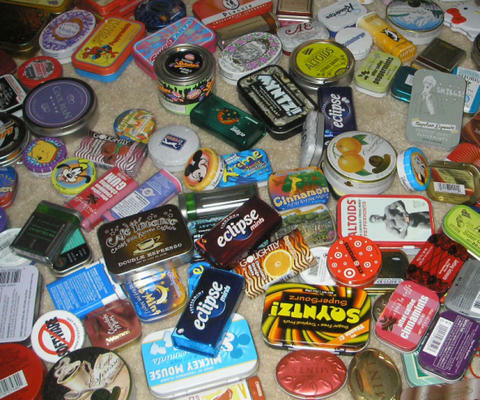 The group’s leader, Chuck, said the notion of collecting mint tins came to him in 1995, when he purchased Altoids for the first time. “I saw how very useful they were for holding small items (paperclips, cloth patches, staples, etc.) and it kind of took on a life of its own after that,” Chuck said. At his last count about two weeks ago, Chuck had around 318 unique tins – including mints from Altoids, Victoria’s Secret, Starbucks, Disney World and small mom-and-pop tins that most have never heard of. Chuck doesn’t really have a favorite, but if he had to choose, it would be a tin that looks like an old Nintendo game controller. Understandably, Altoids are a big deal in the mint tin collecting world, and standard-issue Altoids are Chuck’s favorite type of mint to consume. His least favorite? Ginger-flavored and licorice-flavored Altoids. He said he’ll pass on his collection to his children or family if they’ll have it, though he doesn’t expect it will be worth much money. “It’s probably not worth much, at least for now, unless the hobby really takes off with others (think Beanie Babies, here),” he said. It’s worth something to Chuck, though. He said he’s spent more than $1,000 on his collection over the past ten years, including gifts he has received from friends and family. Unfortunately for mint tin collectors, there’s no preferred way to display their collections. “This is a question I have struggled with,” Chuck said. “There is no easy way, so for now, they are all in a rather large suitcase.” In fact, Chuck wouldn’t mind some suggestions on how to handle his unwieldy assortment of tins. He’s currently considering a big shadowbox or using magnetic paint or Velcro to affix them to the wall. If you’ve got a better idea, let Chuck know in a comment down below. For now, Chuck said, the collector’s group is fairly quiet. If you build the group, Chuck, the collectors will come! Thanks much for the great article! I, and the rest of the Mint Tin group, really appreciate it! is that a spiderman mint tin in the picture up top?! ?if so i would like to buy it.i do not collect mint tins, im in the process of building a headphone amplifier that fits in a present day altoids size mint tin.but my 4 year old son would worship me if i had anything spiderman(if u no any 4 year olds u’ll no what im talkin bout).its called a cmoy amp, google that name CMOY its very interesting then you can c what one looks like in a tin.if not selling would u plz send e-mail of some places i could find some cool tins in that size. hi, i was thinking of starting a mint tin collection, does anyone know a good place to start/look. i checked ebay, but is there anywhere else, thanks.